If you're moving into military housing, you may have questions about whether or not your family's beloved dog is allowed. Where to begin to make an informed decision about where your military family--and your pets--will live? Policies banning specific dog breeds in military housing started back in 2009. An Army-wide memo in 2012 explained that breed bans on bases do not serve their purpose as it is the owner, not the breed, that determines a dog’s behavior. 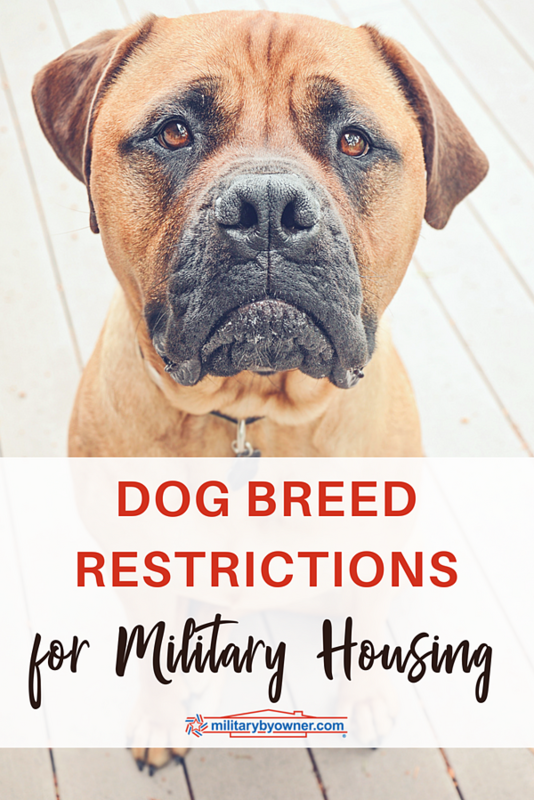 However, since that time, the Army has published a list of banned dog breeds in military housing, including, but not limited to: American Pit Bull, Stafford Bull Terrier, Bull Mastiff, Doberman Pinscher, Rhodesian Ridge Back, and other breeds. The Air Force Standardized Pet Policy states that "Residents may not board dogs of any breed (including a mixed breed) that are deemed 'aggressive or potentially aggressive,' unless the dog is a certified military working dog that is being boarded by its handler/trainer or approval is obtained by the Installation Commander in writing." Breeds on this list include Pit Bull, Rottweiler, Doberman Pinscher, Chow, and wolf hybrids, as well as any other dogs "known to demonstrate a propensity for dominant or aggressive behavior." Each privatized military housing company also has its own specific policy. If you own a dog banned under these policies, this means that either the dog goes or the whole family moves off base. The breed ban list from each housing office clearly states a well-defined list, and violations could result in your family’s eviction. If you find your dog’s breed on the banned list for housing at your next duty station, there are several options that your family could consider. 1) While not recommended, you could be dishonest about the breed and hope to not get caught. Let us, however, work from the assumption that we have an ethical, honorable military member who will not permit such transgressions simply to procure a house on base. The base will use either the breed name listed on your pet’s vet records or, increasingly, will require a dog DNA test to prove the vet’s breed. Base housing on MCB Quantico requires one of the two options and will not accept non-specific breed words such as “mixed” or “mutt” from the vet; everyone knows what those words really mean, anyway! 2) Should your family truly desire to live on base, you can begin to consider alternative homes for your pet. In addition to posting advertisements, research local shelters, but realize that shelters often cannot sustain the high numbers of dogs they receive and will often put down your dog in as little as three days if they have not yet found a family to take him home. These options are heartbreaking for families who see their dog as a member of the family, but there are other options. 3) One option that many families pursue is renting off base. Renting often poses its own set of challenges, however, as most commercial rental communities and deed restricted neighborhoods typically prohibit the same breeds as the local base housing office. 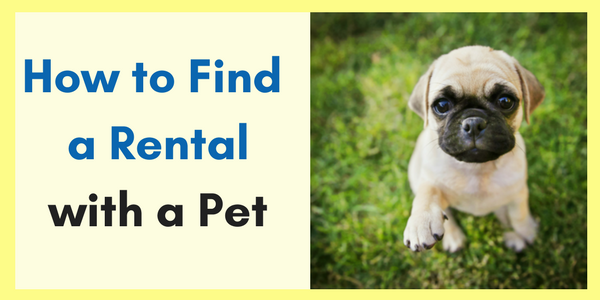 Renting from an individual owner will likely incur restrictions on pet size, but rarely on breed. If your military family makes the choice to move with a dog that is not permitted to live on base, note that you can use the advanced search settings on MilitaryByOwner to filter rentals that accept pets. As military families and dog owners, we know that moving causes its own set of challenges without even considering the challenges that arise when trying to find a place to live with a dog that typically finds itself on breed ban lists. When all else fails in the rental market, many families tell us that they buy homes at each base to make sure they can accommodate the needs of their furry family members. In deed-restricted neighborhoods, breed restrictions may exist, but otherwise, buying a home will free you from pet ban restrictions. To help you better identify a pet-friendly home near your new base that has fenced and spacious yards, consider contacting a real estate agent who can help you quickly identify a home that will best fit your needs! Information updated 2018. Post is for informational purposes only and should not be viewed as legal advice. Check with your installation's housing office for specifics on their pet policies.